Hello friends! I know Christmas is just around the corner, but I wanted to show you this project I made with new products from Crafter's Companion. I think this card could be perfect for Valentines, for a loved one who is deployed or someone who is far away from you like my family. I sure miss them a lot! Create a card base from Ultra Smooth Premium Cardstock. A2 size. Using your eBrush and Spectrum Noir Markers: LY1, LY2 and CT1, create a background. Die-cut and emboss a circle and stamp sentiment from Vintage Sentimentals set in Black Ink. 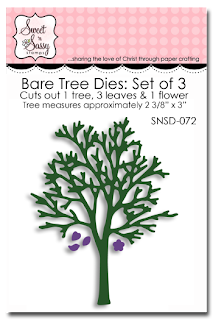 Die-cut leaves (x4) in Green Envy Shimmering cardstock using Delicate Flower Die Set. Die-cut the Lace piece using Lace Heart Cupcake Wrapper Die and Rose Pearl Shimmering cardstock. Adhere sentiment to panel, then add leaves around the circle edge. Add Lace Heart Wrapper to panel, even the sides. Add stitches lines with a fine black pen. Hello friends! How is your day today? I hope it's good and sweet one! Today, I am super excited to show you a project I am really proud about it. Crafter's Companion has the most amazing Cupcake boxes templates!! They are super easy to use and a fantastic way to send a loved one something sweet to make their day!! I used the Gable Cupcake Box, this one can hold up to 6 cupcakes! You can decorate the box with different papers or use just a plain color. Trace your template box on a piece of Construction Cardstock (this one is 16" x 16") or any big piece of cardstock or patterned paper. Trace the sides for the boxes if desired. Here I used double sided patterned paper. Fold all the scored areas. Cut a box base and adhere it to box with super strong adhesive. Cut out your box and decorative sides. Die-cut Leaf Swirls in Green Envy Shimmering cardstock. Die-cut Delicate flowers in Rose pearl, centers in Pink Pearl and leaves in Green envy Shimmering cardstock. Add flowers and swirls to box. Die-cut Lace Heart Wrappers in Rose Pearl and Pink Pearl Shimmering cardstock. Die-cut hearts from Heart Cupcake insert dies. Add them as cupcake toppers. This was a super fun project to make, my daughter thought it would be the perfect gift to give to a school friend! Hello friends! Hope you are having a relaxing day after all the fun a food, enjoy your leftovers!! 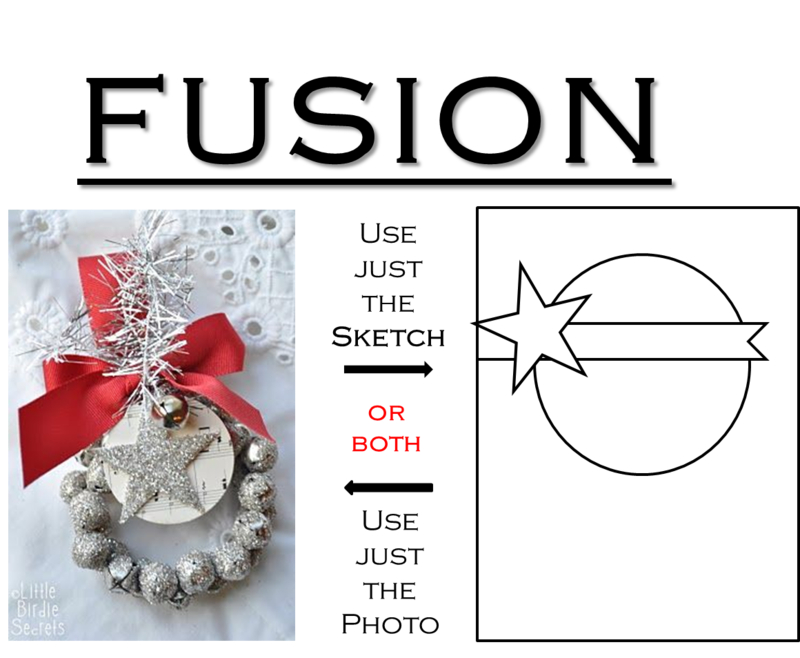 Today, I am sharing with you a Christmas card, super easy, you can mass produce this design in no time. Here I used the Christmas Silhouettes Set. Cut a panel from White cardstock. 3.75" x 5", stamp berries in Versamark Ink, then apply white embossing powder and heat set. Apply light blue and a little bit of Gelatos, mix them with an aqua brush. Stamp sentiment on a piece of Kraft cardstock. Die-cut a large scallop border from White cardstock. Adhere kraft piece to scallop border. Adhere piece to card panel. Die-cut and stamp tree in Golden Glitz Delicata ink. Adhere tree to card panel with foam adhesive. Tie on red twine, add ruby liquid pearls to berries. 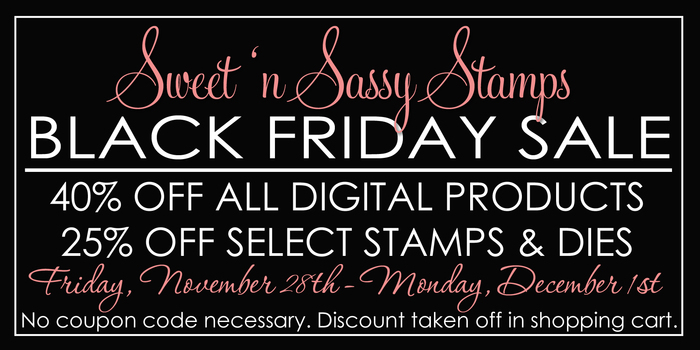 Sweet 'n Sassy has Black Friday deals!! Check out the store for more details! 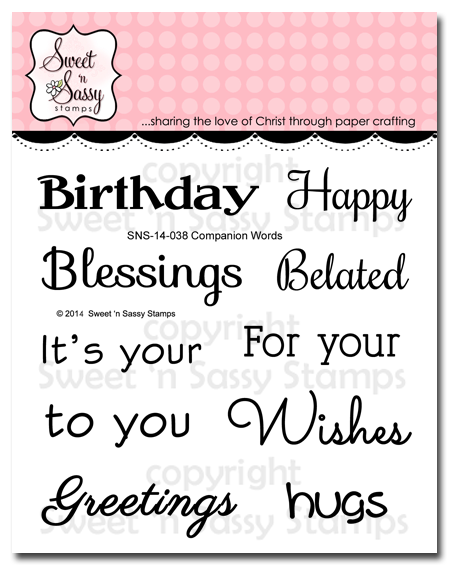 Also, this is my last post as a Design Team Member for Sweet 'n Sassy Stamps. I need t take care of my health and family, in addition of that I have started babysitting again, and the little one needs all my attention. I am not quitting, just cutting on DTs, sometimes you just have to do it. I have enjoying these 2 years of great products, amazing images and great friendship!! Thanks so much Korin for the opportunity to design for you. Hello friends!! If you are here in the USA, I wish you a very Happy Thanksgiving!! Hope this day is special, full of happiness, memories, laughs and great food! I made this cute card using the set Peregrinos/Pilgrims from Latina Crafter, this set has the sentiments in Spanish and English. I colored the images with Spectrum Noir Blendable Pencils, then cut them out. I used the Rays stencil from Tim Holtz and Distress Inks. Then, I die-cut grass from patterned paper and adhere one direct to card base, then added the Pilgrims and turkey with foam adhesive, then added an extra die-cut grass. Finally, I die-cut a banner, stamped the coordinated banner border, then stamped the sentiment. 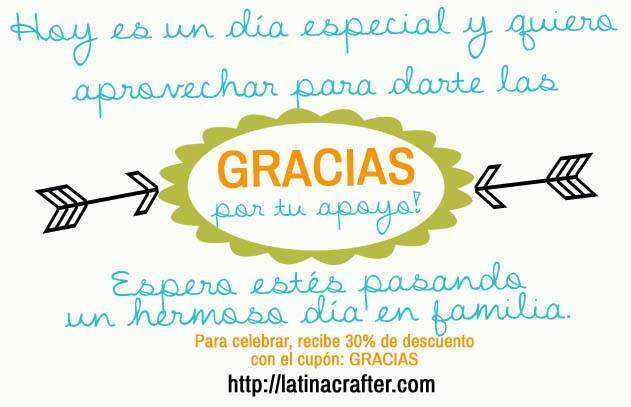 Latina Crafter has a special deal for all of you!! Add the coupon word GRACIAS and you will receive a 30% off on your order!! Offer ends Monday, December 1st. Enjoy it with your family, don't forget to eat pie! Hello friends!! Today, I have a beautiful and very simple card for you using new products from Crafter's Companion. This project didn't take too long to make and I love the results, I think the black cardstock makes the the embossing piece really pop! Make a card base from Ultra Smooth Premium White Cardstock. A2 size. Cut a panel from Mustard White core cardstock, emboss piece with Blutterfly Love Embossing Folder. With a craft sand block, sand the emboss areas gently. Color the ribbon are with Spectrum Noir Markers: TN2, TN3. Then cover the area with Crystal Lacquer and sprinkle clear glitter. Add Crystal Lacquer to little hearts, and small amounts of Star Dust Stickles to butterflies. Cut a panel from Black Pearl Shimmering Cardstock and adhere the embossed panel to it. Stamp sentiment from Vintage Sentimentals Set on White cardstock in Black Ink. Cut it out and add it to card. Finally, add a pearl to embossed bow. 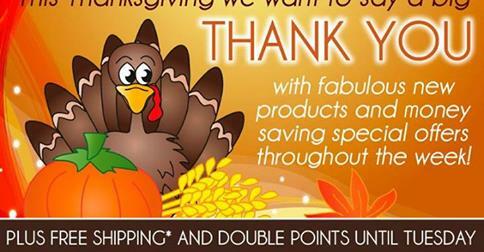 Don't forget the fantastic Thanksgiving and Black Friday deals!! Happy Tuesday! Hope your day is full of joy and great things! Today I have a very simple yet elegant card for you. I used the snowflake die set from Top Dog Dies! I wanted to keep it simple, my original idea, was not this one, I wanted to do something more like "inlaid" design, but while playing with the die-cuts I like the white on white design, so I kept it that way. I used "White, Silver, Red" courtesy of the Fusion Challenge. Cut a panel from White cardstock 3.75" x 5". Die-cut snowflakes (x2) from Top Dog Dies Snowflake trio Set in White cardstock. Die-cut Top Dog Dies Happy Holidays in Red cardstock. Create a layout for your sentiment and snowflakes and adhere them to card panel. Tie on silver organza ribbon. Hope you like it! A very simple card, super easy to mass produce and also very elegant. 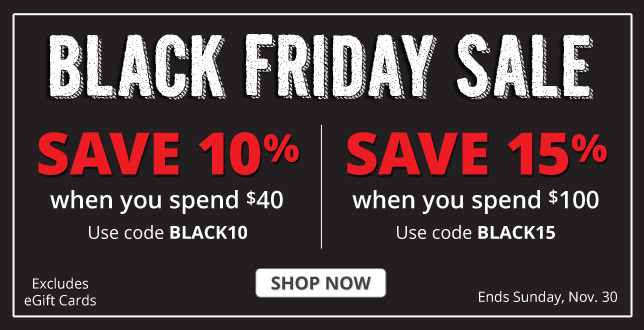 Also, don't forget about Top Dog Dies Black Friday Super Sale!! Hello friends! Welcome to another Heartfelt Creations Alumni Blog Hop! This month I decided to create a Christmas card using this pretty die!! This card is super simple and easy to mass produce if you decide to CAS this card. Cut a panel from Patterned Paper 4" x 5.25" and another panel 3.75" x 4.25", add zig zag stitches. Adhere panel to card base. Die-cut Christmas tree from Green Shimmering cardstock and adhere it to panel. Die-cut snowflake from Gold cardstock and adhere to card with foam adhesive. Stamp Merry Christmas from All Seasons Sentiments on White cardstock in Red Ink. Adhere it to card base with foam adhesive. Tie on ribbon, add rhinestones and pearls to tree. Don't forget to leave a comment in all the blog participating in this blog hop, one random crafter will be chosen from any of the blogs and will win $25 Gift Certificate to Heartfelt Creations Store. You have until November 28th to leave a comment. Hello friends!! Hope you all are having a great day! Few more days to Thanksgiving (here in the USA) and then Christmas!! I love Christmas very much. Ok, so let's get started !! Die-cut the pieces in Ultra Smooth Premium White cardstock. After you piece is dry (yes, let it dry for few minutes), emboss your piece. Hand cut a couple of white hills, adhere one direct to the embossed piece, then add the other one with foam adhesive. Finally, add the snowman and dog. Add some silver confetti if you wish (as I did here). Stamp the sentiment in Versamark ink and Silver embossing powder, add a piece of red cardstock and adhere it to card. The embossed panel measured 3.75" x 5". Adhere it to a Kraft card base. Hello friends! Happy Friday. Today, I have a couple of cards for you using brand new stamps, just released few days ago by Latina Crafter. For this card I used the new stamp Nena con Banner (Banner Girl) and the sketch from Viva La Verve Week 2. For this card I went super CAS, I used the new stamp set Disfruta (Enjoy) and the sketch from Retro Sketches. I used the little flower and repeat stamping it in different colors (All Memento Ink), then I stamp the sentiment in St. Valentine Archival Ink. Finally, I added White Opal Liquid Pearls. Party Time Tuesday: Anything goes. Hello friends! Hope your Wednesday is a good one, full with craftiness and fun. Today, I have an easy and clean card for you using new dies from Top Dog Dies!! Cut a panel from white cardstock, 3.75" x 5". Ink all edges with Tumbled Glass Distress Ink. Stamp doilies on a piece of White cardstock in Versamark ink and apply white embossing powder. Then take your stamped piece and using the dotted tag from Top Dog Die Gift Tag Set, die-cut the piece. Take the Top Dog Dies Hello Die Set and die-cut half of it from the stamped piece. Adhere tag piece to card panel. Die-cut a Hello word from Shimmering Red Cardstock and add it to the negative space of the tag. Using a scrap from the embossing piece, trim a thin piece and adhere it to the right side. Tie on twine and add rhinestones and pearls. Hello friends! Happy Tuesday, I wanted to share this card long time ago, then it got into draft and to the next page and I am glad I found it and it is here for you! This card is super easy and love the mixed media look of it. I used the new Dreaweaver Embossing Pastes, available now at Crafter's Companion and also the new Sheena Douglas' stencils. Make a card base from Textured blue cardstock. 5" x 6"
Cut a panel from Ultra Premium White Cardstock 4" x 6". Spray the background with Memento Fireworks Summer Sky, London Fog and Rhubarb Stalk. Let it dry for a minute or so. Take your Sheena Douglas Liberty Stencil, combine Dreamweaver Pearlescent Embossing Paste and Gold Metallic F/X and apply over the stencil with a Palette Knife and Paste Spreader. Also, mix the Dreamweaver Pearlescent Embossing Paste and a bit of green reinker, and apply to the grass area. Stamp sentiment on a piece of light blue cardstock. Die-cut and emboss it with Circle Dies. Die-cut and emboss a scallop circle piece using gold metallic sheet. Mount sentiment with scallop piece. Adhere stencil piece with a yellow piece of cardstock and add stitches. Add sentiment to panel. Add panel to card base. Hard to see on the pictures, but the image really shimmers, it is beautiful!! Hello friends! How are you today? I don't usually post on Sundays, but today I am making an exception. Last few weeks has been very stressful, a lot of things going on here, family members in Peru got really sick, 2 of them got in serious condition, Tuesday night I couldn't sleep and first thing I did before starting my day was to check on Facebook and found out my cousin passed away, I was so sad, then while talking to my sister about few things and how my dad was doing (since he didn't sleep much staying at the hospital until 5:30 am), she got a phone call letting the family know my aunt passed away too. My heart sank at that very moment. I just wanted to travel and be there with my family. Hard to deal with grieving sometimes, but I am doing better. 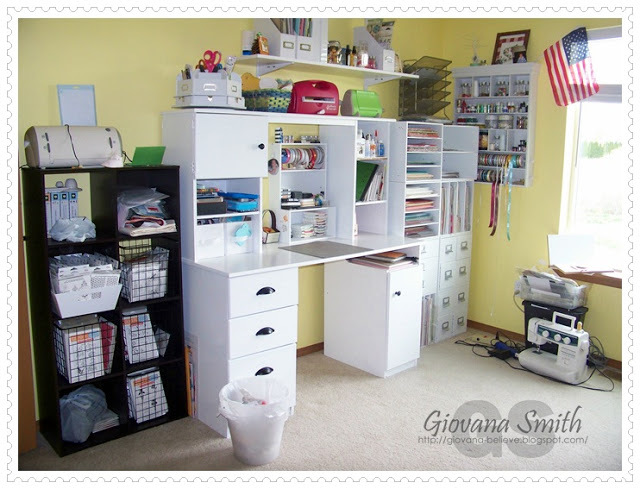 November 3rd was my birthday, my husband birthday present was a white counter for my craft room so I could have a bigger desk. I packed everything and move boxes to my daughter's play room. I thought it would be done in no time, but it took a lot longer than I expected. 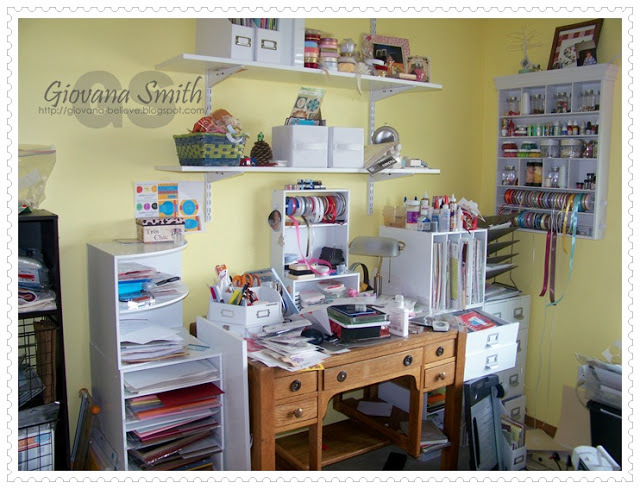 So today, I have an evolution of my craft room! I would say I have downsized a lot, I have tons of thing to sell and giveaway. Craft room 2012-14: I bought an old computer desk at a yard sale for $8.00! I painted it white and used it until 2 weeks ago! Nothing fancy, but it worked out pretty well for me. Well, this old desk could hold the universe, LOL. 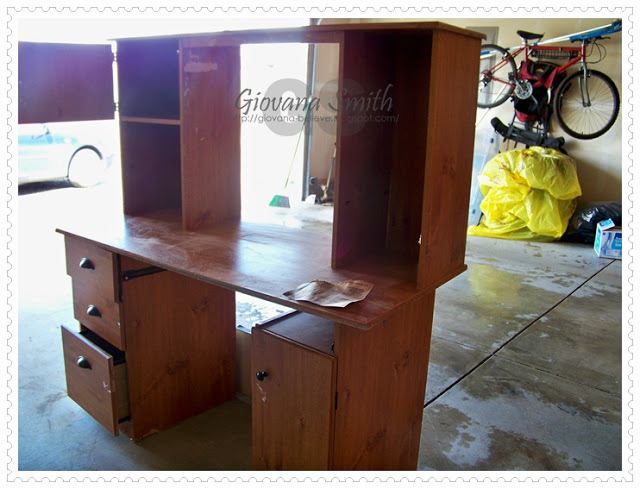 You can not imagine how many boxes of stuff I got from this desk!! Check out the new desk!! I love my new desk!! More counter space and believe it or not, I clean up after a project is finished. Sharing this with my crafty friends at the Moxie Fab Blog! And yes, my craft desk is clean, yay! Ok, before I leave, why not be forever friends?! Yes! I love this very simple card I made with Latina Crafter products. I die-cut the "amigas die" 4 times and glue them together and stamped the sentiment "para siempre" in Black Archival ink. The leaves and dots are from a promotion set. Love the color combo, I think less is more sometimes. Well, this post is a little bit long, hope you didn't mind. Sweet 'n Sassy November Release! Hello friends! 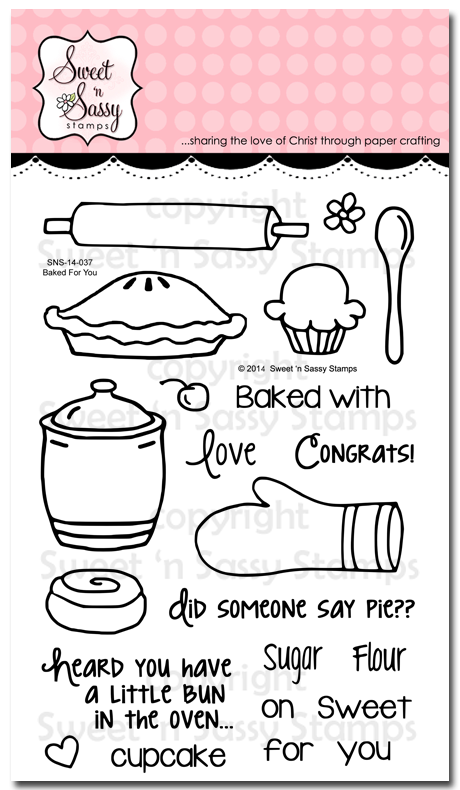 It's time for another fun Sweet 'n Sassy Stamps Release! 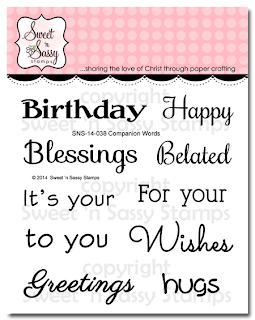 This month we have a variety of stamps and dies plus the bundles from the Sweet Club will be available for you too! Let me show you the projects I have for you today. 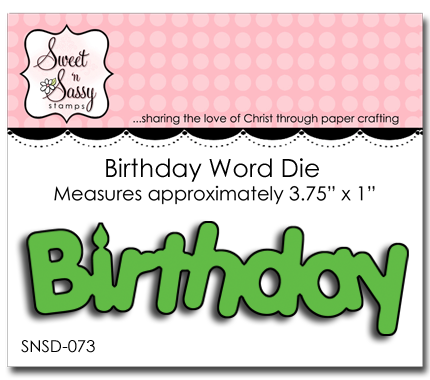 Birthday Word Die and Companion Words Set. I combined these 2 to create a couple of birthday card, two very different styles. Happy Birthday: I posted this on the SNSS blog yesterday. This card was super easy to make, with a little bit of mixed media touch. The sentiment was stamped in Black Archival ink, I die-cut the Birthday word in watercolor paper and colored with Distress Inks, then added Crystal Lacquer and sprinkled clear glitter. Super easy and fun!! Birthday Wishes: This is a very feminine card with a little bit shabby chic touch. For this card I used leftover shabby chic papers I got long time ago, added lace, ribbon, flowers and twine. The papers were zig-zag stitched. I used Grunge Borders set in Versamark ink and then added white embossing powder and heat set. 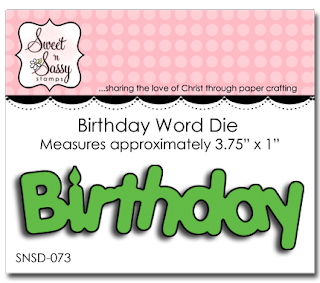 I kept the Birthday word die just plain white to create a contrast. The sentiment was stamped in Brown Archival ink. Baked for you Set: This is one of the sets that was part of the Sweet Club, I used the super cute sentiment to create this super fun card!! For the stove I used a polaroid die and used it upside down, it was created with a couple of pieces chipboard and orange cardstock, hard to see, but I added a piece of film. For the image, I stamped the bunin Memento Tuxedo Blakc and colored it with Spectrum Nor markers. Then, I used a fine black marker and drew the baking sheet and oven rack. After that, I added sequins on the center of the image and added the stove door. 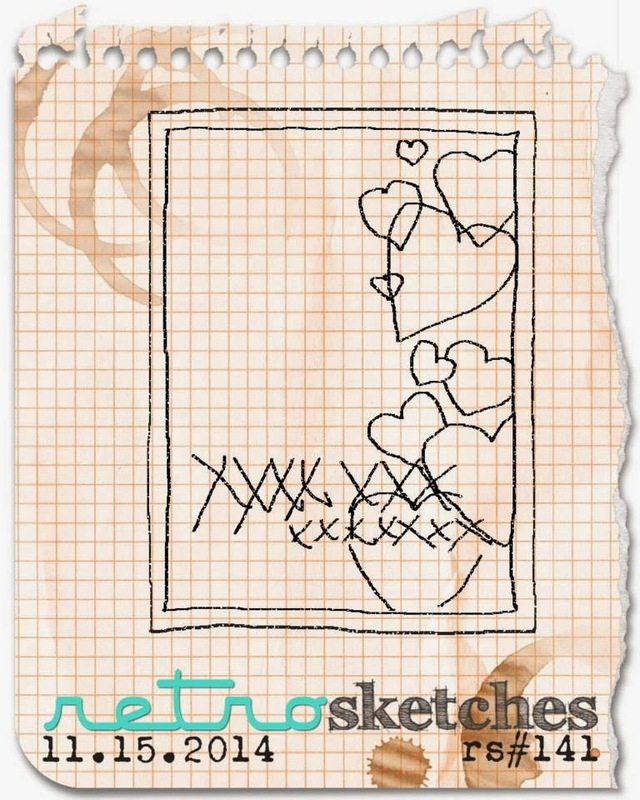 Sentiment was stamped in St. Valentine Archival ink. Finally , added ribbon and heart pearls to the stove. 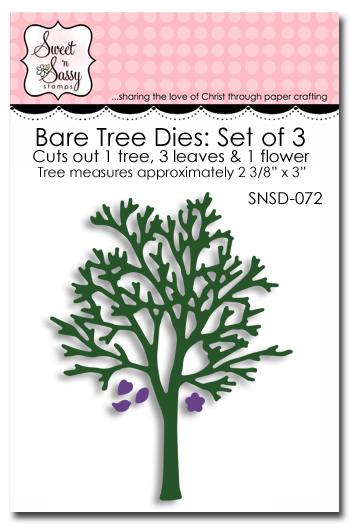 Scripture and Sentiment Companion & Bare Tree Die: I combined these 2 new products to create a monochromatic card, I wanted to keep it simple and elegant. Hope you like it. I die-cut the bare trees in white cardstock (x2) and 1 in White Metallic Sheet, I also die-cut 1 small tree from this set. The sentiment was stamped in Brown Archival ink, I created a little hill, added the sentiment on a rectangle piece, then glue the trees, added glitter and silver glass. Finally, I added the rectangle panel with dimensionals to a white card base. 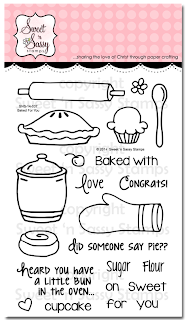 We'll draw 1 winner from this week's challenge to receive a $10 credit to the Sweet 'n Sassy Stamps Store! Thanks for joining us today! Be sure to join us again on Friday, November 21st to see if you've won! Have a fantastic day and enjoy the hop!